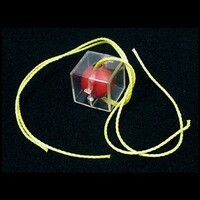 The magician shows his spectators a solid wooden ball, a clear plastic case and two cords. 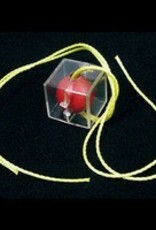 The cords are threaded through a hole in the ball, which is placed inside of the case. The cords are then threaded through holes in the sides of the case. The magician then ties the spectator's finger to the case with the cords. The spectator then watches as the cords visibly penetrate the ball, case and their finger. The props supplied do all the work for you. No sleight of hand required. No complicated gimmicks to break, no complicated moves to remember.